If you sign up for a European hacker camp such as CCC Camp in Germany or SHA Camp in the Netherlands, you’ll see among the items recommended to take with you, a DECT handset. DECT, or Digital Enhanced Cordless Telecommunications, refers to the set of standards that lie behind the digital cordless telephones that are ubiquitous across Europe and some countries elsewhere in the world. These standards cover more than just the simple two-way telephone calls through a base station that most Europeans use them for though, they define a fully functional multi-cell 3G phone and data networking system. This means that an event like SHA Camp can run its own digital phone network without having to implement cell towers. Reading the history of DECT, there is the interesting snippet that the first DECT product on the market in 1993 was not a telephone but a networking device, and incidentally the first wireless LAN product on the European market. Olivetti’s Net3 provided 512kB/s wireless networking to a base station with Ethernet or Token Ring interfaces for connection to a LAN. In its original form it was an internal card for a desktop PC coupled to a bulky external box containing radio circuitry and antenna, but its later incarnations included a PCMCIA card with a much smaller antenna box. The half-megabit speed seems tiny by today’s standards, but in the pre-multimedia world of 1993 would have been perfectly adequate for a Novell Netware fileserver and an HP Laserjet 4. [Heinz Wolff] swallows a condom in another Olivetti promotional image. So DECT is an interesting technology that can do more than just a simple cordless phone, and its first product was unexpectedly somewhat groundbreaking. It then becomes even more interesting to find that Net3 has left very little evidence of itself to find that can be found on the Web, and learning more about it requires a little detective work. The Wikipedia entry has the bare bones, but it speaks volumes about the obscure nature of the product that the encyclopedia’s only picture of it is a tiny thumbnail-sized promotional image of the PCMCIA variant in a chunky mid-1990s laptop. 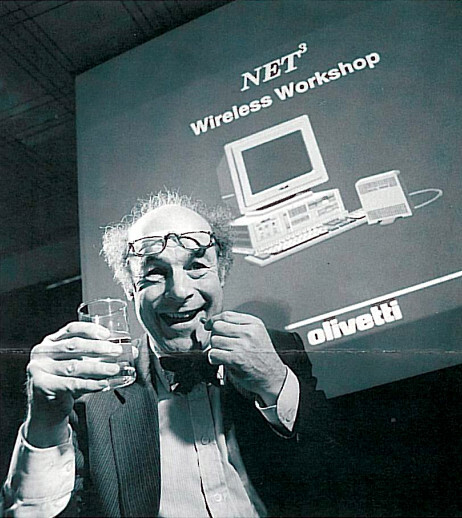 A further search reveals a 1993 British Olivetti staff newsletter (PDF) carrying another promotional image of the desktop Net3 device featuring the then-well-known TV personality and academic [Heinz Wolff] demonstrating the technology bizarrely by swallowing a DECT medical instrumentation transponder wrapped in a condom. Some press releases remain in the fossilized remnants of the 1990s internet, and a Net3 design team member’s LinkedIn page led us to the patent covering the system, but that’s pretty much it. We can’t even find a high enough resolution image of a Net3 card for our featured image slot. It’s obvious that Net3 and DECT networking as a high-end wireless LAN before a need for wireless LANs existed never made it, but what is perhaps more interesting is that it seems to have left no legacy for other more mundane applications. We are in the midst of an explosion of hype around the Internet of Things and it seems new short-range wireless networking technologies appear almost daily, yet the world seems to have overlooked this robust, low power, and mature wireless network with its own dedicated frequency allocation that many of us already have in our homes. It seems particularly surprising that among the many DECT base stations on sale at your local consumer electronics store there are none with an Internet connection, and there is no market for IoT devices that use DECT as their backhaul. In the open-source community there has been some work on DECT. The OsmocomDECT project for example provides a DECT software stack, and deDECTed.org states an aim to “better understand DECT and its security and to create an Open Source implementation of the DECT standard”. But there seems to have been very little hardware work in our community on the standard, for example there are no DECT-specific projects on Hackaday.io. Net3 then was a product before its time, a herald of what was to come, from that twilight period when the Web was definitely a thing but had yet to become the world’s universal information repository. Public wireless networking was still several years in the future, so there was no imperative for road warriors to equip themselves with a Net3 card or for computer manufacturers — not even Olivetti themselves! — to incorporate the technology. It thus didn’t take the world by storm, and unusually for such a ground-breaking computer product there remains little legacy for it beyond a rarely-used feature of the protocol Europeans use for their cordless phones. Did you have a Net3 card? Do you still have one? Let us know in the comments. Long before everyone had a smartphone or two, the implementation of a telephone was much stranger than today. Most telephones had real, physical buttons. Even more bizarrely, these phones were connected to other phones through physical wires. Weird, right? These were called “landlines”, a technology that shuffled off this mortal coil three or four years ago. It gets even more bizarre. some phones were wireless — just like your smartphone — but they couldn’t get a signal more than a few hundred feet away from your house for some reason. These were ‘cordless telephones’. [Corrosive] has been working on deconstructing the security behind these cordless phones for a few years now and found these cordless phones aren’t secure at all. The phone in question for this exploit is a standard 5.8 GHz cordless phone from Vtech. Conventional wisdom says these phones are reasonably secure — at least more so than the cordless phones from the 80s and 90s — because very few people have a duplex microwave transceiver sitting around. The HackRF is just that, and it only costs $300. This was bound to happen eventually. This is really just an exploration of the radio system inside these cordless phones. After taking a HackRF to a cordless phone, [Corrosive] found the phone technically didn’t operate in the 5.8 GHz band. Control signals, such as pairing a handset to a base station, happened at 900 MHz. Here, a simple replay attack is enough to get the handset to ring. It gets worse: simply by looking at the 5.8 GHz band with a HackRF, [Corrosive] found an FM-modulated voice channel when the handset was on. That’s right: this phone transmits your voice without any encryption whatsoever. This isn’t the first time [Corrosive] found a complete lack of security in cordless phones. A while ago, he was exploring the DECT 6.0 standard, a European cordless phone standard for PBX and VOIP. There was no security here, either. It would be chilling if landlines existed anymore. This pile of hardware marries telecommunications hardware from distinctly different generations. [Andrew D. Farquharson] wanted the retro look and operation of a rotary phone, with the convenience of a modern cordless. He combined the two technologies to achieve his goal. The first problem was to find a way to translate the rotary inputs to something he could use. There are already a bunch of projects that use rotary hardware so he didn’t have to reinvent the wheel. 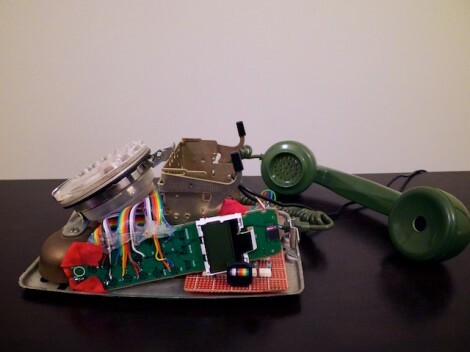 He followed this guide to connecting Arduino to a rotary phone. The next step was to interface with his cordless phone. He ditched the case and soldered rainbow ribbon cable to the entire button matrix. An opto-isolator is used to protect the Arduino while making each connection. Finally, he patched into the mechanism which monitors the cradle to see if the handset has been picked up. It sounds like his code lets you enter the number on the dial, then pick up the handset to actual transmit it through the cordless phone.